This paper bubble wrap system is an amazing on-demand recyclable protective packaging solution that has it all: cost-efficient, shock-absorbent, scratch-resistant, easy to use and attractively presenting packaged goods in the box. 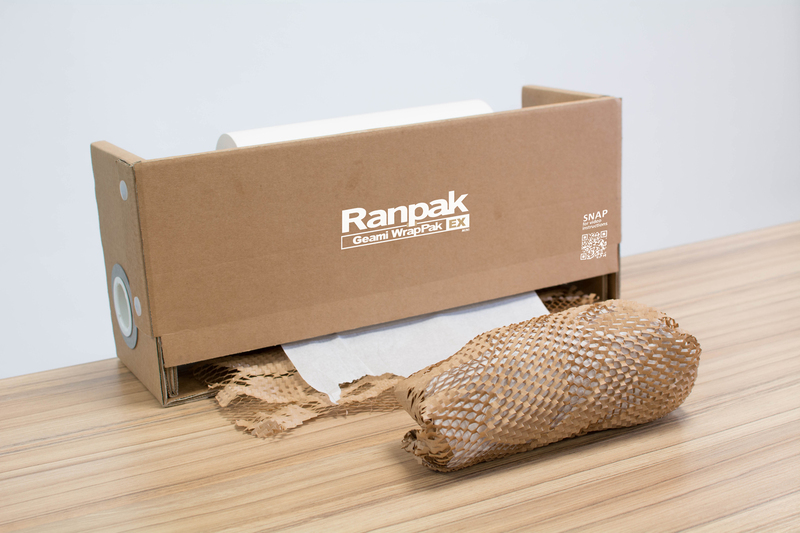 It saves time and space too as this paper packaging can be used for wrapping, cushioning or as block and brace instead of bulky void fill. Use for wrapping glass, china, jars, cosmetics, pharmaceuticals, electrical goods, household goods, artwork and gifts. 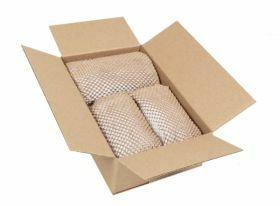 The dispenser box transforms rolls of die-cut brown Kraft paper into an extraordinarily effective kind of paper bubble wrap– like a 3-D honeycomb – dispensed complete with a white tissue interleaf. Now available in a compact portable box dispenser, our Geami paper bubble wrap all-round packaging is the eco-friendly organic alternative to plastic cushioning materials, foam packaging or cumbersome void fill like packing peanuts. It offers remarkable strength and shock-absorbency, enabling your packages to withstand hard knocks and drops. 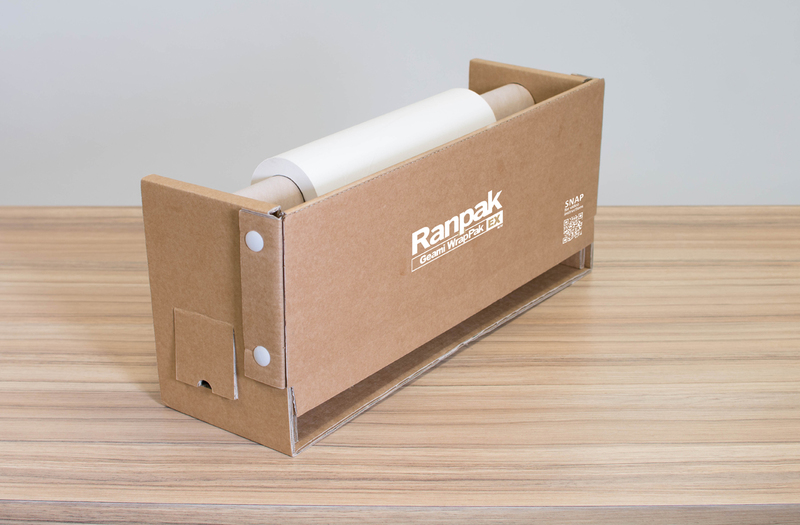 A true green packaging solution, it consists of a brown Kraft paper roll which, horizontally die-cut into thousands of slits, is converted into a 3-D web of angled cells when you pull it through the Geami WrapPak expander box. This attractive but robust honeycomb structure holds packaged products in place and provides superb cushioning. A layer of white tissue paper is interleaved simultaneously to provide surface protection for your goods. The brown paper roll, at 85m long, yields to 135m when expanded. It is 50.8cm wide, while the tissue is 30.5cm wide. The honeycombed material is extremely flexible, easy to handle, tear off as required and shape round items. There’s no need for scissors or tape; you securely wrap items just by intertwining the angled cells together. The wrap combines optimum protection with soft tissue and a pleasing natural in-the-box presentation. If desired you can further enhance the appearance of boxed products by finishing with a simple cotton ribbon and bow. 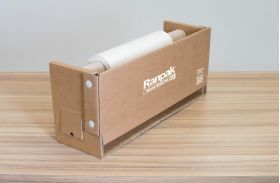 Suitable for both business and domestic use, this paper packaging system can be used for most packing applications. 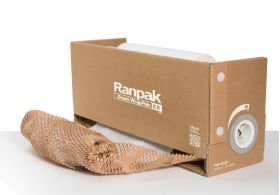 Its flexibility makes it ideal when mailing odd-shaped or bulky items and for producing instant block-and-brace void fill protection in shipping boxes. Requiring far less storage space than conventional bubble wrap rolls, it’s also easy for customers to dispose of: clean, neat and going straight to recycling. Made from sustainable natural material, Geami paper bubble wrap with tissue interleaf conforms to environmentally-friendly aims while offering a time-saving and efficient general wrapping solution.